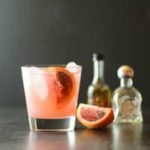 A recipe for a Kiss of Light Margarita made with tequila, Licor 43, plus the juice of fresh lime and orange. In a cocktail shaker filled with ice, add tequila, Licor 43, and lime juice. Shake vigorously. Pour liquid into a rocks-type glass filled with ice. Squeeze and drop the 1/4 blood orange into the drink. Enjoy! Recipe originates from Casa Noble and used with permission by The Baddish Group.